Aha! 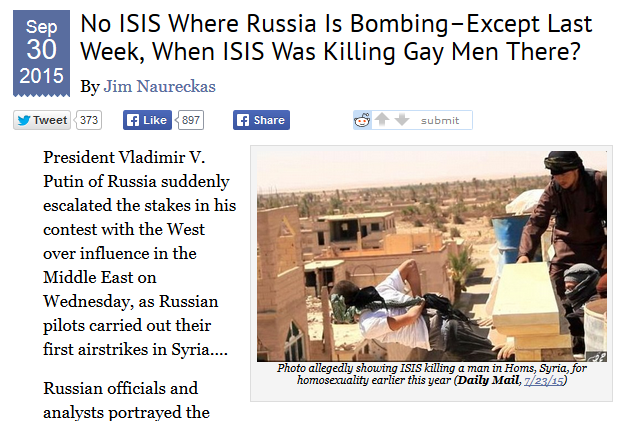 The title of the post makes much of this: “No ISISWhere Russia Is Bombing – Except Last Week, When ISIS Was Killing Gay MenThere?” Except, again: There were activists, on the ground, with no apparent incentive to lie, stating quite clearly: “None of the areas targeted” – including “Zafaraneh, Rastan, Talbiseh, Makarmia and Ghanto” – were controlled by IS. FAIR doesn’t get around to mentioning such casualties, concerned as it is with proving that the Russians government was telling the truth when it asserted that those it bombed were members of ISIS. It even uses a photo of ISIS executing men accused of homosexuality from another source it would never normally cite, The Daily Mail, to suggest again that the activists are liars – though the photo is from months before, in another city that is not Rastan. Perhaps, in the name of fairness, and accuracy, Naurecakas should amend the post with a devastating correction, as he did one of the last times he wrote about Syria and claimed a regime chemical weapons attack was a false flag. Perhaps, I would suggest, he stop writing about Syria altogether. This entry was posted in Journalism Watch, Syria and tagged FAIR, syria. Bookmark the permalink.